Suspect In Would-Be Airport Bombing Nabbed With Help From REI : The Two-Way Someone left an improvised explosive device at an airport in Asheville, N.C., last week, and a new backpack offered a clue. Some are wondering why the incident didn't receive more national attention. 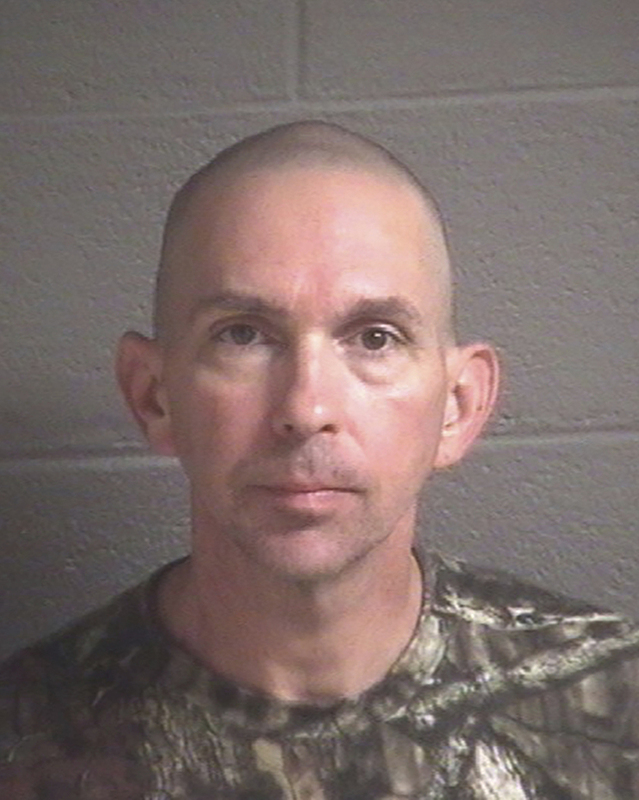 An undated photo provided by the Buncombe County Detention Center shows Michael Christopher Estes, who is accused of planting an improvised explosive device at the Asheville Regional Airport in North Carolina on Oct. 6. Someone left a bomb at the Asheville Regional Airport. That much was clear. The question was, who? The airport in Asheville, N.C., serves tens of thousands of people every month. According to an affidavit, federal marshals called the FBI on Oct. 6 to report the presence of an improvised explosive device. Bomb technicians neutralized the device, which was packed inside a glass jar. Bomb dogs indicated the presence of explosive material. Analysts determined that the bomb was powered by ammonium nitrate, packed with nails to serve as shrapnel, and set to go off on a timer — an alarm clock, minus its bells, set to 6 o'clock. As for the man who dropped it off, FBI investigators had surveillance footage — a white male wearing black clothes, with a black cap. He'd walked in after midnight and left a bag inside the building. They also found a brand-new backpack in the woods near the airport — REI's "Traverse 70" brand. Inside the bag were gloves, a fuel source, a roll of Gorilla Tape, and "what appeared to be an alarm clock bell," Agent James Anderson writes, "consistent with the bell missing from the clock" in the bomb. Plus there was a spoon — gray, polymer. FBI agents also tracked down surveillance footage of a white male apparently purchasing some of those materials, as well as other bomb-making supplies, at a Walmart and Lowe's in Arden, N.C. But he paid cash at both venues, and the FBI still didn't have a name. Then they found an REI, an outdoor goods store, in Asheville where a man had recently purchased a new backpack. A Traverse 70. He also bought a spoon — gray, polymer. There was no video footage this time. And again, the man paid cash. But, Anderson writes, "the individual ... used an REI membership number when paying." An REI membership entitles a customer to 10 percent back on purchases every year. In this case, it also gave the FBI a name — Michael Estes. After releasing a still photo from the surveillance footage, authorities found Estes in downtown Asheville. He was arrested on Oct. 7. Estes told authorities that he created the bomb and placed it at the airport but said he did not actually set it to go off, the FBI says. Estes said he was prepared to "fight a war on U.S. soil." The suspect has been charged with multiple federal crimes and is currently in custody. For the first few days, this story received little attention outside of North Carolina. Now, it has been brought to the national spotlight, largely because Shaun King, a columnist for the Intercept, wrote about Estes on Wednesday. King pointed out the particulars of the story — an improvised weapon, planted at an airport, by a man who said he was declaring war. King asked what would happen if the attacker were "an immigrant, or a Muslim, or a Mexican ... Mainstream American outlets would be covering the heroic bravery of those who thwarted the terrorist plot. ... in this case, though? Crickets." Every year, law enforcement officers in America make multiple arrests over improvised explosive device plots or incidents in which no one was actually injured. The level of news coverage, as King notes, can vary enormously. In February, Adam Hayat allegedly made several explosive devices and left them at a hotel in downtown Denver, scrawling "explosives" on a closet door mirror. He was later arrested in Los Angeles. His federal case is ongoing. Also in February, a Florida man named Mark Barnett allegedly created improvised explosives to plant in Target stores along the East Coast as part of a profit-driven bomb plot. Someone he allegedly attempted to recruit to his plot turned Barnett into authorities and he was charged in federal court; his federal case is ongoing. In July, Luke Mullen was arrested after allegedly making bomb threats against the Colorado Springs Airport; police say he had four explosive devices and a machete inside his vehicle. Also in July, a blast outside the Bixby Air Force Recruitment Office in Oklahoma caused property damage but no injuries. Benjamin Roden, a former airman, was arrested and is facing federal charges in connection with the incident. In August, Elijah Blankenship in Ohio was arrested and charged with creating multiple homemade explosives. His arrest came shortly before an anti-racist vigil in honor of the victims of the Charlottesville, Va., attack, but court records don't indicate whether there was a connection to the event. In September, the Georgia Bureau of Investigation announced that Douglas Kennedy of Tifton, Ga., was charged with manufacturing explosive devices after a bomb went off in the parking lot of the Tift Regional Medical Center; no one was injured. Kennedy had allegedly constructed and detonated at least three other bombs, none of which hurt anybody. Earlier this month the FBI unsealed charges against three alleged ISIS supporters accused of plotting attacks in New York City in the summer of 2016. The alleged plot, which involved improvised explosive devices, was foiled by law enforcement, the FBI says. In each of those instances, an apparent plot was never carried out to completion; if a bomb did go off, no one was hurt. None of those stories made headlines here at NPR.org. Barnett's Target scheme, the Bixby recruiting station blast and the foiled ISIS plot were covered in many national outlets. Hayat, who is of Pakistani descent, received relatively little coverage in the national press but was featured on multiple right-wing websites, including Breitbart News. Other incidents, including the arrests of Mullen, Blankenship and Kennedy, were covered almost exclusively on the local level.